The Old Man of the Woods is a quite distinctive fungi that grows under conifers and hardwoods in Eastern North America. It is a shaggy "black" mushroom, its shagginess described as "loose" and "wooly." Like Portobellos, it has the tendency to turn whatever it is cooked with a dark colour. If you have ever made mushroom risotto with Portobellos you know what I mean. It's not necessarily a bad thing to happen. 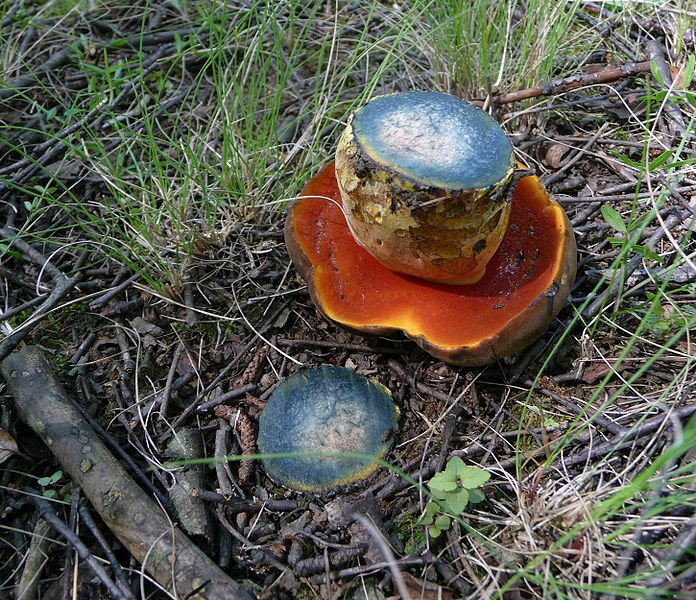 Old Man is in the classification of Boletus, which have "tubes" rather than "gills" on the underside. In this regard, they resemble the underside of "shelf" fungi, which Chicken of the Woods (an earlier post) is one. Boletus is a classification of mushroom distinguished by the absence of gills on the underside. There are over 100 separate species in the genus. The genus contains many members which are edible and tasty; others are bitter and still a few others are poisonous. 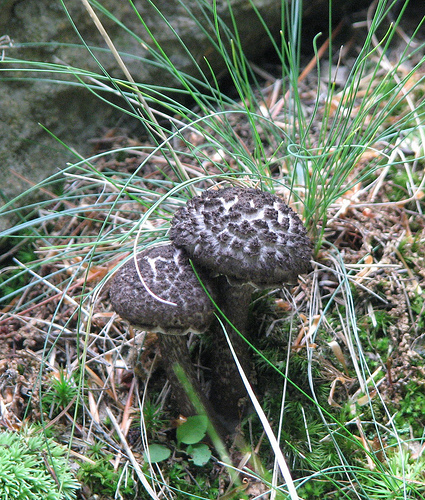 Caps are from 5-15 cm across, convex, dry and with thick, fibrous, black scales on a greyish to grey-brown background. Flesh is white, staining red to black. Tubes are white, and stain red, then black. Stalks are up to 13 cm tall by 3 cm wide, coloured as the cap, and shaggy. Spore print is black. Old Man of the Woods fruits on the ground or dead wood. Edible. 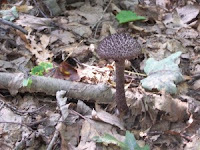 Some people do not like the taste of Old Man of the Woods, but from what I have read, it's probably somewhat due to its similarity to the "meaty" Portobello. Others say it tastes like ground… when pressed it comes out that it's more of a woodsy, spicy aroma. Young Old Man of the Woods specimens (is that an oxymoron?) are the ones to choose when foraging, as they gain more "flavour" as the mature. that stains blue when cut. 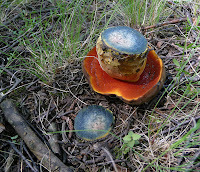 An important note: although most boletus mushrooms are edible, and some even "choice", avoid ANY that stain blue when cut or bruised. Those are poison. As always, have an excellent printed description guide, or experienced mushroom picker, or both, with you. I would highly recommend Mushrooms of Ontario and Eastern Canada as one of your field guides. It even has a plasticized cover so you can take it with you on sorties. So you have it in your kitchen. Now what? Many sites suggest substituting 1/4 of the regular mushrooms in a mushroom soup. That actually sounds like a good idea to start. They enhances the "mushroominess" and impart a wilder taste than "tame" white mushrooms. 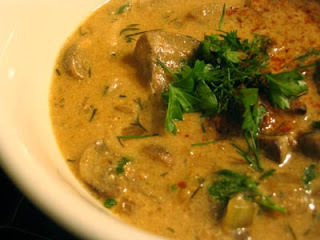 So here's a recipe from http://allrecipes.com//Recipe/hungarian-mushroom-soup/Detail.aspx that would be a good one to try, but you can substitute part (or all) of any of the mushrooms in dishes you make. "This creamy mushroom soup is seasoned generously with dill, paprika, parsley, and lemon juice. Sour cream is added at the end of cooking, making the soup very rich and filling." Melt the butter in a large pot over medium heat. Saute the onions in the butter for 5 minutes. Add the mushrooms and saute for 5 more minutes. Stir in the dill, paprika, soy sauce and broth. Reduce heat to low, cover, and simmer for 15 minutes. In a separate small bowl, whisk the milk and flour together. Pour this into the soup and stir well to blend. Cover and simmer for 15 more minutes, stirring occasionally. Finally, stir in the salt, ground black pepper, lemon juice, parsley and sour cream. Mix together and allow to heat through over low heat, about 3 to 5 minutes. Do not boil. Serve immediately.